Also known as soybean curd and bean curd, custard like white tofu is made from curdled soy milk, an iron-rich liquid extracted from ground, cooked soybeans. It's easy to digest, low in calories, calcium and sodium, high in protein and cholesterol-free—all of which makes it one of today's most healthful foods. 1. Roll each tofu piece in cornstarch to coat. 2. 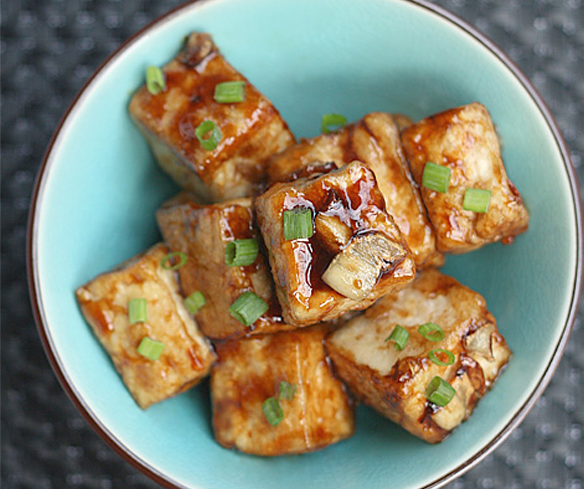 Heat oil in a pan and fry the tofu pieces until golden brown.Set aside. 3. Remove excess oil in the same pan except for 1 tbsp and fry garlic until brown. 4. Add oyster sauce and sugar, give it a little stir. 6. Sprinkle with chopped green onions before serving.